The Blind Men and the Elephant – The Response! Drawing by my friend Danny Martinez. 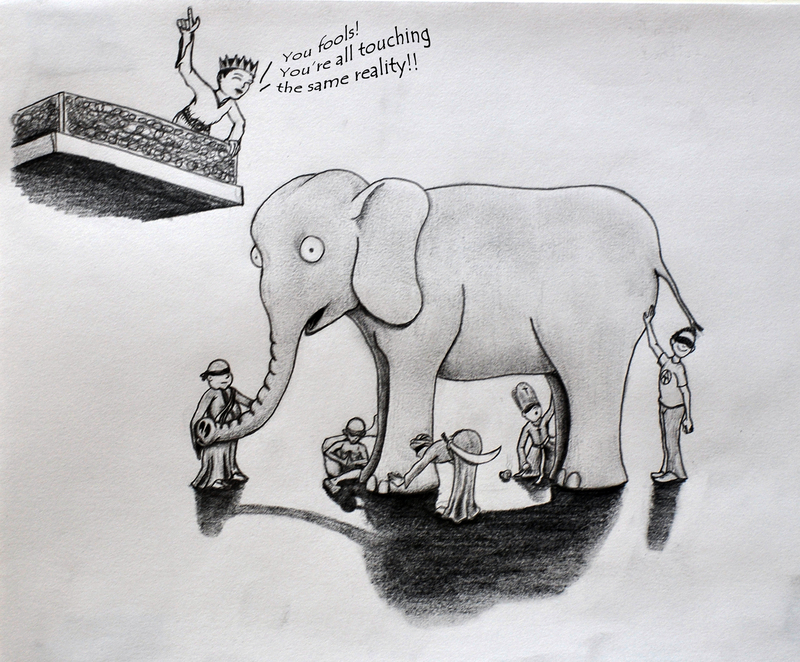 A popular analogy that depicts an “all religions lead to God” form of pluralism is the story of several blind men touching various parts of an elephant and being unable to agree on a single description of the creature they’re touching. This story has connections to Jainism, Buddhism, Hinduism, and even Sufi Islam, a mystical branch of Islam. The story is found in the teachings of the Buddha within the Pali canon of Theravada Buddhism. One of the most popular versions comes from a nineteenth-century poet, John Godfrey Saxe, who rewrote the story in rhyme. the elephant’s trunk might think the elephant is a snake. Individually, they each know a part of the elephant accurately, but not the sum total of the animal. They fail to grasp what the elephant actually is because of their blindness. Their dispute is futile since they are all mistaken. It is pretty clear how this story can be used within the framework of pluralistic relativism. Christians, Jews, Muslims, Hindus, Buddhists, and the like are all touching the same sacred elephant, God. But because all of humanity is spiritually blind, we are incapable of knowing God as he actually is. Any fighting among religious faiths is thus futile. On the flip side, the good news within pluralism is that every religion is true based on what its adherents have experienced of the sacred reality. Since all religions have touched the sacred elephant, all religions lead to the same divine truth. Religious pluralists argue that if humanity could only come to “see” this predicament, all religious fighting could stop. We could recognize what each religion has learned about God and, by compiling the parts of the whole, come to a better understanding of who or what the nature and personhood of the sacred reality is. The view of the divine expressed by the sacred elephant analogy is plausible and worth considering. Before considering the accuracy of its assertions, I want to stress the pluralistic uses of the story. Far from saying all religions are true, the story of the blind men and the elephant takes all religions and throws them under the bus, where they are left broken in their false perceptions of ultimate truth. As hopeful as this story can appear, in reality it just drops the bomb on absolute truth, at least absolute truth concerning God. The blind men show us that truth concerning God is unobtainable due to our limited faculties. Skepticism toward God doesn’t invalidate this brand of pluralism. The problem lies within itself. Nestled within the story of the blind men and the elephant is a self-contradiction that makes the entire claim crumble in on itself. The pluralists claim that God is unknowable; every religion is wrong about its perceived understanding of the divine. However, in making this claim, the pluralists also implicitly declare they have an inside track on who God is. If no one is capable of knowing God due to our lack of sight in the realm of the divine, then what prescription glasses have enabled the pluralists to know the nature of God with such certainty? Pluralists are rejecting all exclusive truths concerning God, but making one themselves. End of excerpt from Contradict – They Can’t All Be True. This parable is actually claiming that all religions are false. This parable makes all aspects of life subjective. There is no absolute, objective reality that we can be certain we are experiencing correctly. If absolutes don’t exist in a way that we can comprehend them, morals and ethics also become subjective. There would no longer be such a thing as right and wrong. Any exclusive religion, such as Christianity, Judaism, and Islam are forced to give up their claims to exclusivity to fit into the inclusive, pluralism which this parable projects. With Christianity’s exclusive claim that Jesus is the only way to salvation, all other religions would have to be false if Christianity is true, or Christianity could be false and other religions true. This does not fit with the elephant analogy at all. The original telling of this legend has a king who sees the blind men groping at the elephant arguing about what they are touching. The king reveals to them in laughter that they are all foolish men that they are all touching the same reality, the elephant! This is very interesting that the original legend has a word from above revealing the truth to the blind men. This indicates that the truth is actually discernible – we might just need some help from someone up above. The original ending of this parable lends itself very well to Christianity. Christianity teaches that help did come from above. That God has revealed himself to mankind through what he has created as well as through special revelation from the Scriptures and in particular through the second person of the Trinity, Jesus, taking on flesh and walking amongst us, revealing the truth to us, healing the blind and helping them see. This revelatory claim of Christianity isn’t even considered or introduced in pluralistic uses of this parable. Conclusion: Declare truth where truth is found! It seems clear that all religions cannot be fully and equally true. There are direct contradictions within the teachings of the world’s religions, such as Jesus is God (Christianity) and Jesus is not God (Islam), which eliminate the possibility that all religions are true. This however doesn’t mean that aspects of the truth cannot be found within various religions. Christians would do good to point these truths out from time to time. If Christ’s claim is true that he is the way, the truth, and the life (John 14:6), then all truth would be God’s truth, no matter where it is found. Where truth is found, declare it, use it, put it in its full context of which it is fully and directly revealed from God in the Bible. The Apostle Paul did when he quoted the philosophers of the Athenians (Acts 17). We can do it too! Buddhism’s 3 Marks of Reality and 4 Noble Truths! A Buddhist channel on Youtube, LamaKungaChoedak, commented on this video and said,”Not bad.” I take that as a compliment. Here is an overview video I made to teach the core teachings of the Buddha. When you see Buddhism practiced in temples, you likely won’t recognize many signs of these teachings. This is why many people say that Buddhism, as it was initially taught, is not a religion, but a philosophy. As Buddhism spread, its philosophy mingled with the folk religions of the regions it encountered, and thus what we see now is largely not a faithful adherence to the Buddha’s teachings. I’ll make a video in the near future that will illustrates the different branches of Buddhism. Throughout this video I suggest some talking points with Buddhist for beginning to interject the teachings of the Bible in relationship to Buddhism. It’d be great to read your thoughts on those discussion questions in the comment sections of this post. If you want to be sure to see future videos, subscribe to my Youtube channel, this blog, and the Contradict – They Can’t All Be True Facebook page.